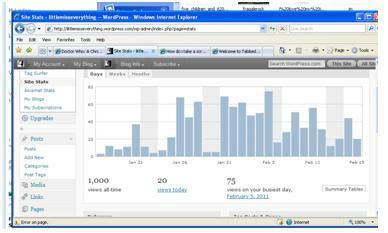 At 12.15 yesterday morning UK time I clocked 1,000 hits to my blog! Yay! I started writing on here just under 2 months ago and I’m really proud that I’ve made it this far and managed to build up a supportive community of readers and comment-ers (is this a word?!!) 1,000 may not put me in the big leagues but I’m chuffed by it. More importantly, I’m so pleased I started writing on here and I’m loving getting to know the blogging community, making new friends, starting and taking part in great debates. So a big thank you to my subscribers, people who comment regularly or anyone who has stopped by and taken time out to read my words – I really appreciate it! Congratulations! It is exciting to watch the numbers go up. Keep writing. Congrats! That’s so awesome, girl! Congrats! I enjoy reading your posts!! Congrats! I think thats quite impressive! I’ve been writing mine a year in May and I just reached 1,000 last week! 🙂 So good for you! Aw thanks, congrats to you too!! Hooray! I love looking back to last year when I started blogging to see the progress that I’ve made over the year, it’s amazing. I would flip if I were to ever be Freshly Pressed but we can all dream right? Congrats on reaching 1,000 hits! It’s a great feeling, isn’t it?